The holiday season has arrived and with it comes a fine selection of children's flicks on DVD. After you take the kids to see "Bolt," whip up a batch of Jiffy Pop and treat them - and yourself - to these other animated hits. Sure to be the recipient of the 2008 Oscar for Best Animated Feature, Pixar's out-of-this-world triumph about a futuristic, trash-compacting robot isn't just the year's finest family film, it's one of its finest in general. 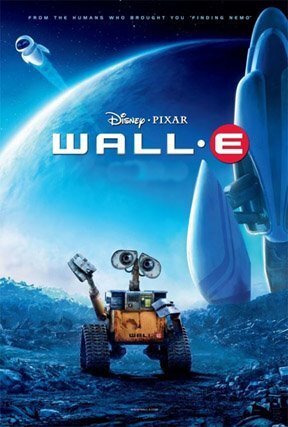 With mind-blowing computer animation and one of the most surprisingly natural love stories in light years, "Wall-E" is not to be missed. 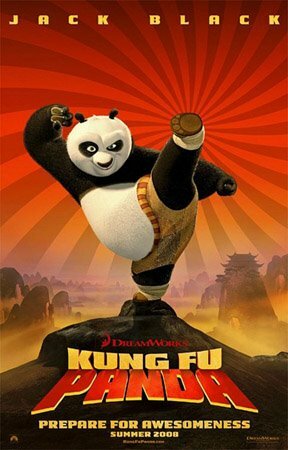 Comedy superstar Jack Black gives what may be his best performance as the voice of an overweight panda bear who unwittingly becomes the hero of his Asian village. Action-packed and beautifully designed, "Panda" is increasingly entertaining escapist fare. Additional voice talents include Lucy Liu, David Cross, Ian McShane, Angelina Jolie, and Dustin Hoffman. The best screen adaptation yet of a work by the immortal Dr. Seuss, "Horton" abandons the ill-conceived live-action approaches employed in the abominable "Cat in the Hat" and the average "Grinch," and instead renders Seuss' Who-tastic environments via colorful CGI. 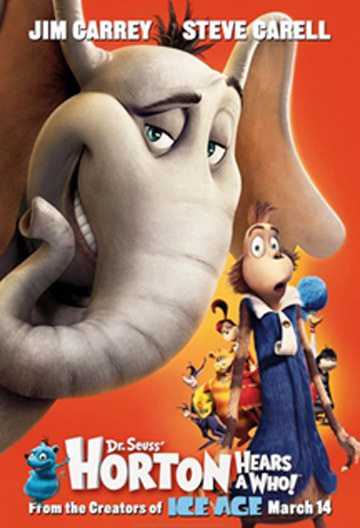 "Grinch" actor Jim Carrey returns as the voice of Horton the elephant and is supported by a cast that includes Steve Carrell, Seth Rogen, and Carol Burnett. One of the most gifted and respected actresses in Hollywood, Kate Winslet certainly needs no introduction. In addition to starring in one of the most tremendously successful box-office hits of all time ("Titanic"), the the 33-year-old England native also holds the record of being the youngest person ever to have garnered five Oscar nominations. While she has yet to claim an Academy Award, she's received multiple accolades from the Screen Actors Guild, BAFTA, The National Society of Film Critics, and even won a Grammy. Similar to her colleague, the great Meryl Streep, Winslet is a transformative performer, capable of tackling a wide array of character types. She's portrayed a murderous teenager, a romantic aristocrat, a Jane Austen heroine, an eccentric modern woman, and a desperate housewife, to name a few. As her record-breaking career highlights show, she's got talent and insight far beyond her years. This December, Winslet will be appearing in two prestigious pictures, both of them gathering some considerable Oscar buzz for their star. In "Revolutionary Road" (directed by Winslet's husband, Sam Mendes), Winslet plays an unsatisfied suburban woman and reunites with her "Titanic" co-star, Leonardo DiCaprio. In "The Reader" (directed by "The Hours" helmer, Stephen Daldry), she tries her hand at a German accent as a former Nazi on trial for war crimes. If the Academy is impressed with her work (as they usually are), she'll not only continue her record-breaking tradition, she may just have to make some room on her shelf. From Stephen Daldry and David Hare, the director and writer of 2002's acclaimed film, "The Hours," comes this gripping post-WWII mystery. Based on the 1995 novel of the same name by Bernhard Schlink, the film tells the story a young man who has an affair with an older German woman, then reunites with her when she's on trial for war crimes. One of two December releases to feature the great Kate Winslet (the other is husband Sam Mendes' "Revolutionary Road"), "The Reader" also stars Ralph Fiennes and Bruno Ganz. Superstar Will Smith reunites with his "Pursuit of Happyness" director, Gabrielle Muccino, in this existensial tale in which he plays a man who must seek penance by - apparently - paying it forward, so to speak, to seven strangers. The preview below is rather cryptic about the plot. The supporting cast includes Woody Harrelson, Barry Pepper, Michael Ealy, and the lovely Rosario Dawson. In this journalistic thriller, Kate Beckinsale plays a Washington D.C. reporter who refuses to give up her source for a turbulent story at all costs. The film's distributors have intriguingly not released a familiar, all-encompassing trailer, but a series a brief clips. I chose the one in which Beckinsale confronts the fantastic Vera Farmiga, who presumably plays one of the subjects of her story. Money is tight. Theaters are noisy and crowded. Do your wallet and your sanity a favor and hang out at home with these acclaimed independent gems, now available on DVD. Veteran actor Richard Jenkins ("Six Feet Under," "North Country") gives a heartfelt, subtle performance as a disillusioned college professor in this intimate drama from actor-turned-filmmaker Thomas McCarthy ("The Station Agent"). When Walter Vale (Jenkins) finds an illegal immigrant couple living in his Manhattan apartment, he begins a life-changing personal journey that allows him to rejoin the human race. 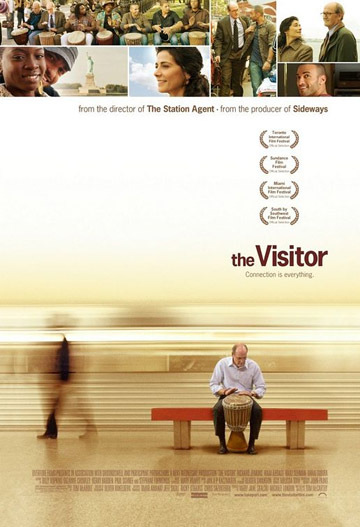 With remarkable supporting performances from Haaz Sleiman, Danai Jekesai Gurira, and Hiam Abass ("Paradise Now"), "The Visitor" is one of the most uniformly well-acted films of 2008. 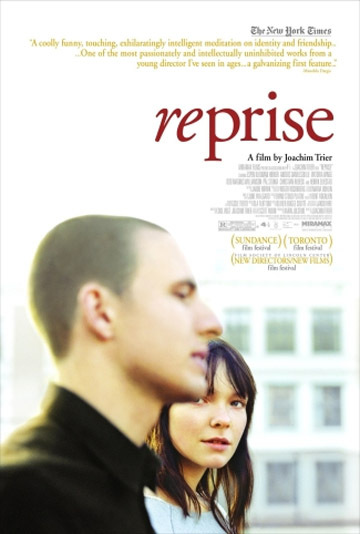 The feature debut from 34-year-old Danish filmmaker Joachim Trier, "Reprise" tells the turbulent coming of age story of two competitive friends, both of whom are driven by similar passions in work, life, and love. The film, which calls to mind the signature styles of the masters of the French New Wave, has picked up an armful of festival awards, from Best Picture and Director from its home base of Norway to the Discovery Award at Toronto International. Young talents Anders Danielsen Lie and Espen Klouman-Hoiner play the two friends and Viktoria Winge is the trusty muse. A talented and diverse cast, including Woody Harrelson, Emily Mortimer, Ben Kingsley, and Thomas Kretschmann, inhabits this "Murder on the Orient Express"-type thriller from writer/director Brad Anderson ("Next Stop Wonderland"). 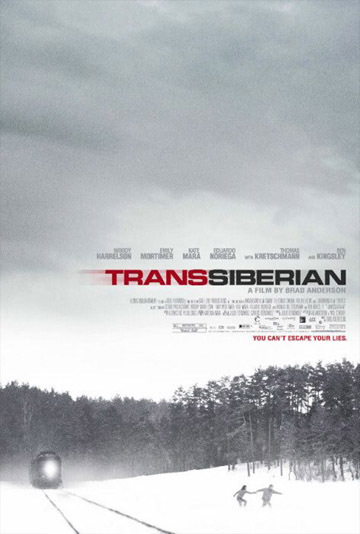 During a rather routine Trans-Siberian train ride from China to Moscow, an American couple meets an interesting group of passengers while attempting to salvage their relationship. When a sub-plot involving drug-trafficking turns things ugly, they find themselves fighting for their lives as well.